Ideal for Creating a Home Gym & Interlocking Design makes these Easy to Set-Up and Store Away when finished! The Gold Coast hard wearing interlocking exercise mats are ideal for placement underneath training equipment such as treadmills, exercise bikes and weights benches, and the surface also enables you to perform floor exercises. These mats are ideal for a range of popular exercises including Yoga, Pilates, Aerobics and general Circuit Training both in the gym and at home. 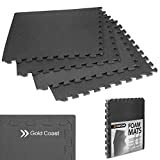 Made from high density EVA Foam and featuring an anti slip patterned finish, the set includes 4 interlocking mats (measuring 60 cm by 60 cm and a thickness of 1.2cm) giving a surface area of 1.44m² but this can easily be extended if you purchase another set. The pieces are connected using the ‘jigsaw’ shape and can easily be taken apart and stored away when not in use. The outer edge of the mat can be removed to reveal additional interlocking shapes to allow additional mats to be added. Comprising of a non-slip water resistant surface that is easy to clean, the mats are 100% waterproof and will remove any markings with a damp cloth. The mats can also be placed underneath kitchen appliances including washing machines and tumble dryers to prevent marking the floor and reducing floor vibration when in use.